Marshalltown Community School District is one of 39 in the state selected for the Teacher Leadership Compensation (TLC) program for 2014-2015. Dr. Susan Pecinovsky, associate superintendent for student achievement, told the board more about what that system will look like within the District. The award was announced last week and will bring $1.6 million to the District for model classroom teachers, instructional coaches, and curriculum/professional development leaders. All the positions will be recruited from amongst current District Staff. Dr. Pecinovsky and Superintendent Marvin Wade have a meeting with the Department of Education later this month to receive further guidance on implementation. Marshalltown’s four-year graduation rate decreased and the five-year graduation rate increased according to figures released by the Department of Education last week. The 4-year rate was 81.59 percent, down 3.5 percent from the year before. The 5-year graduation rate jumped from 81.77 percent to 89.37 percent. Dr. Pecinovsky noted the use of Net High has given more students the opportunity to complete credits in ways not available before, which could contribute to more 5-year graduates. Still, Dr. Pecinovsky said, the emphasis needs to be on getting students to graduate in four years. “We want [students] to graduate, but we really need to get [them] the supports to do it in four years,” she said. The 9-12 dropout rate for 2012-2013 was also up: 7.45 percent compared to 6.35 percent the previous year. Dr. Pecinovsky said the numbers had been shared with high school administrators and the next steps are to look at the data to determine who these students are, what is happening if they aren’t graduating, and how more students can graduate in four years. “Let’s not keep doing more of the same if it’s not getting us the outcomes we need,” Dr. Pecinovsky said. Dr. Marvin Wade, superintendent of schools, stressed that this is a district-wide discussion, not just a high school issue. He said the District will need to examine supports and programming at all levels. The Delegation for the Advancement of History, an extra-curricular club at Marshalltown High School, will travel to Chicago March 21-22, visiting the Field Museum and the Art Institute of Chicago. The Board approved the out of state trip, which will include 13 MHS students and two chaperones. The club is new to MHS and is supervised by social studies teacher Tim Johnson. The Marshalltown Area Health Careers Club will visit Washington University Medical School in St. Louis, Mo., April 4-5. This is the third year the MHS club will visit a regional medical institution. GEAR UP and Marshalltown Medical & Surgical Center cover the trip costs. Dan Terrones, MHS dean of students, MHS teacher Erin Weatherly and MMSC CEO John Hughes will chaperone the 26 students. Matt Tullis, director of equity and learning supports, gave an overview of the Carol M. White Physical Education Program (PEP) grant at Monday’s meeting. The Board is set to vote on the 2014-2015 budget at the April 7 board meeting. Monday the Board decided to publish a budget based on a tax rate of $18.15, an increase of $0.62 from 2013-2014. This would address both property devaluation and previous budget deficits, maintaining the overall financial health of the district in combination with the estimated budget reductions. The proposed budget will be published in the Times-Republican and is also available here. Marshalltown Community School District is considered “property poor” with an overall lower tax valuation than other Iowa districts. Property valuations dropped from $963 million in fiscal year (FY) 2013-2014 to $927 million in 2014-2015. In the spring of 2013 the Board approved a tax levy of approximately $17.84 per $1000 valuation. This levy was based on zero percent allowable growth from the Iowa Legislature. After the levy was approved the Legislature approved 2 percent allowable growth and 2 percent one-time funding, allowing the district to decrease the levy to $17.53. General Fund budget projections for next year show a $250,000 deficit. While the District saw an 80-student enrollment increase, there was also a 68-student open-enrollment increase. Early projections on salary and benefits packages show an increase of $1.66 million. The increased tax levy would equate to an additional $33 in taxes on a $100,000 home. The selection of Marshalltown Schools for the Teacher Leadership and Compensation System was great news for many reasons, including the opportunity to expand continuous improvement efforts currently in place. Among other things, TLC funding will allow us to extend the Comprehensive Literacy Model from its current K-6 implementation to K-8. It will also support skill development in Sheltered Instruction Observation Protocol for teachers K-12. Applications for Model Classroom Teacher, Instructional Coach, and Curriculum/Professional Development Leader positions will soon be announced. When the positions are posted, I encourage instructional staff to consider applying for one of these new professional opportunities. The positions are available only to current employees of Marshalltown Schools, so I anticipate a strong candidate pool since we have a large number of truly outstanding teachers. Tonight the Board considered options on property tax rates for funding our upcoming school year. We have a history of holding our tax levy rates constant and adjusting our services accordingly. Many know that the State has started the roll-back of commercial property valuations throughout Iowa. This effort will change the balance of property tax burden over the long term, but for the short term it will affect the funding of schools, local, and county governments. Like these other entities, MCSD will be challenged to reduce services to meet the funding decline of 3.5% while our cost rise and estimated 4% this next year. As a Board, we can raise tax rates and funding to accommodate the changes and can continue to provide consistent services to the community. As in any business, our rate of return for your investment needs to be reviewed and weighed by our tax payers. We ask for your input as we consider the choices that affect our District. The Board reviewed and approved change orders from four separate constructions projects Monday night. First, a change order for the Support Services Building addition and site development resulted in a $6,612 savings. Change orders related to remodeling the old Anson Middle School for administrative offices added $22,786, which still falls within the 5 percent contingency budget. Change orders for the Roundhouse project ad a net addition of $40,677 and a change order for the Miller Middle School 1957 classroom remodel was $16,652. 504.32/R Special Health Services for Students, mark reviewed. 505.2 Student Activity Fund, mark reviewed. 505.3 Class or Group Gifts to School, bring back for first reading. 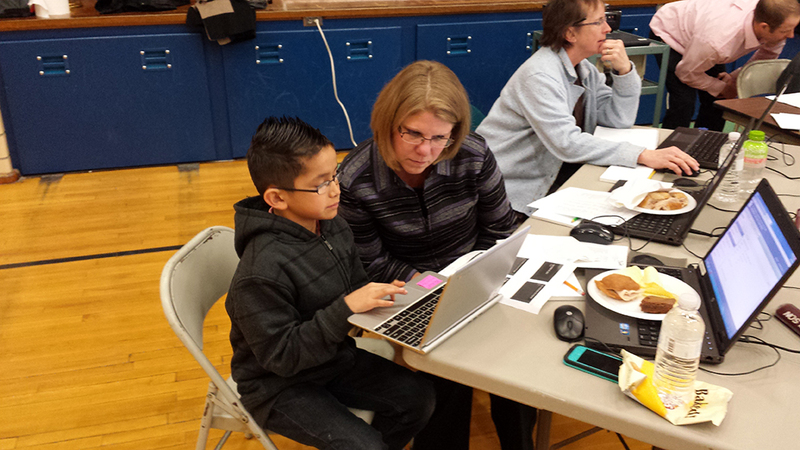 Woodbury Elementary students sat down with Board members Monday to share work they’d done using Chromebooks. Marshalltown High School juniors Libby Crawford and Chandler Fisher qualified for the National Forensics Tournament, marking the sixth consecutive year of qualification by MHS students. Both students came to the Board meeting Monday to be recognized and talk about their experience in forensics. Learn more here. In preparation for publishing a budget proposal for 2014-2015, the Board of Education reviewed tax levy information and discussed local property values. The Board reviewed two possibilities for next year. First, setting a tax levy at $17.82749. This increase would cover the property devaluation. Another option set the taxy levy at $18.15082. This would address both the devaluation and previous budget deficits, maintaining the overall financial health of the district in combination with the estimated budget reductions. No decision was made Monday and the Board will look at a formal budget to publish at the March 17 meeting. School boards in Iowa must submit their budgets to the state no later than April 15. Monday we received word Marshalltown Community School District is one of 39 in Iowa selected for the state’s Teacher Leadership System. The fact we were chosen out of the 146 applicants is a clear example of the hard work that went into creating a strong application. Selection for this means we’ll be able to expand upon current teacher leadership structures. Read more here. 503.2 Student Organization, enhanced definition of “curriculum-related organizations” and used examples from IASB, waive second reading. 503.3 School Publications, waive second reading. 503.6 Interscholastic Competition, waive second reading. 504.7 Emergency School Closings, added “district website” to list of notifications, waive second reading. 504.30 Head Lice, bring back for first reading with changes from school nurses. 504.31 Medication Administration to Students, mark reviewed. Nurses recommended changes to regulations.